A revolutionary handset has really arrived in the scene to catch your Hearts and as the name defines, it really is a milestone. We are referring to all new smartphone from the kitty of Motorola- Motorola Milestone. Motorola Milestone has arrived to take to new milestones with its ultimate features and mesmerising design. It physically measures 115.8 x 60 x 13.7 mm and weighs 165 g. Its display type is 3.7" TFT capacitive touchscreen, 16M colors and screen resolution is 480 x 854 pixels. Accelerometer sensor, Proximity sensor for auto turn-off and and ultimate QWERTY keyboard with 5-way navigation key are its other highlights. It has internal memory of 133 MB storage, 256 MB RAM and supports the card slot of microSD, up to 32GB, 8GB included. New Motorola Milestone supports GSM 850 / 900 / 1800 / 1900 and its 3G Network is HSDPA 900 / 2100. 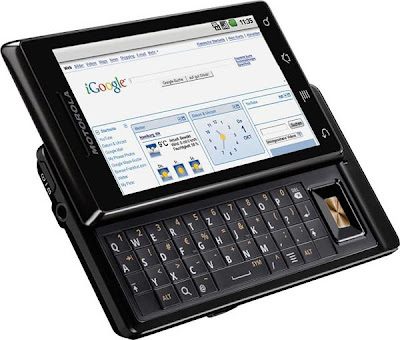 Stunning Motorola Milestone also takes care of the music department very well and for that it has MP3 and MP4 players. For internet browsing there is, GPRS Class 12 (4 1/3 2/2 3/1 4 slots), 32 - 48 kbps with EDGE class 12 and for data transfer there is Bluetooth. Motorola Milestone has an ultimate camera with 5 MP, 2592 x 1944 pixels, autofocus, dual-LED flash. There are lots of other features to make you gaze at it. Go get it!! !